David McHugh, who manages the interests of the likes of Rob and Dave Kearney, explains what his job entails. Rob Kearney has been with McHugh's agency since the age of 18. So the fictional character Jerry Maguire closes his ‘mission statement’ in the Cameron Crowe-directed film named after the Tom Cruise-played protagonist. That production has provided sports fans with mainstream insight into the demanding life of sports agency, even if several elements of truth are highly dramatised. The perception of sports agents is of men operating in a shady world where money rules every decision, but as David McHugh – whose Line Up firm acts on behalf of international rugby stars like Rob Kearney, Fergus McFadden, Donnacha Ryan, Mike Ross, Ian Madigan and Dave Kearney – explains, his reality is not as cutthroat. For Wicklow native McHugh, having “enough money to do what you want, but not enough money to do nothing” is important, but ensuring that his clients are happy, skilled, prepared for life after professional sport and able to switch off from rugby are the more crucial cornerstones of his philosophy. In the 1996 Hollywood production cited above, Maguire laments that “[w]e are losing our battle with all that is personal and real about our business,” but nothing could be further from the truth for McHugh, a former student of St. Andrew’s College, Dublin. By maintaining a relatively small client base in rugby, he ensures that strong rapports are at the heart of his work. So how did he get to this point? As McHugh outlines, many people “think they can be agents” but it remains a difficult sphere to break into. What does it take to get into a position where rugby players feel comfortable being represented by you? Just as he strives to ensure his clients are “rounded”, the same applies to McHugh himself. Malcolm O’Kelly, McHugh, Kearney and Maeve Buckley at Line Up’s Docklands offices in 2010. ©INPHO/Dan Sheridan. His experiences in international sport are certainly an aid in understanding the likes of the Kearney brothers and McFadden. His latter years at St. Andrew’s saw McHugh team up with fellow student Tom Fitzpatrick as a sailing duo, with the pair going on to win up to 20 national and international titles before going full-time in 1998 with the ultimate aim of qualifying for the 2000 Sydney Olympics in the 470 class. When they reached the Olympic standard, it looked as though the dream was to become a reality but the Irish Sailing Federation cruelly denied McHugh and Fitzpatrick their opportunity. That cold-hearted rejection led to obvious dismay for McHugh, and he stepped away from the sport that he had loved for some time. With the advantage of hindsight, however, he recognises that his international sporting experience – appreciating the highs and lows of professional sport – now “adds value” to his work. It’s another string to a multi-faceted bow. Having dropped out of sailing, and with a diploma in Marketing and a Business Studies degree secured, McHugh’s work on behalf of Canterbury Ireland led to a relationship with Leinster, one which saw him eventually taking over as operations manager, and then team manager, of the province. Seven seasons of whirlwind involvement with Leinster followed, much of it under the tutelage of Paul McNaughton. While the Heineken Cup successes materialised after McHugh had decided to move on, there is still a sense of pride at having played his part in the journey. Having lived in that “bubble” for seven years, McHugh made up his mind to branch out on his own, and the fact that “the part that I enjoyed, and the part that I was good at, was looking after the players” resulted in his founding of what is today Line Up SME [Sports Media Entertainment]. McHugh in 2006, during his time as Leinster team manager. Head coach Michael Chieka is also pictured. ©INPHO/Dan Sheridan. Along the way, Maeve Buckley has come on board to add her considerable experience to the mix. The former Platinum One CEO [Fintan Drury's firm] had previously worked with clients such as FC Barcelona, Real Madrid and the Ryder Cup; her skills were in line with the rounded services that Line Up aim to offer. Part of that process is working to match rugby clients to brands that suit their specific personalities. McHugh explains that each of his players has a unique selling point [USP] that can make them attractive to certain brands and products. He uses Ireland prop Mike Ross, a self-confessed tech geek, as the ideal example. “Mike’s USP is technology. He has had partnerships with Samsung, EA Sports, and writes for the Irish Independent and Lineout magazine reviewing gadgets. All those things are potentially value-adding to him for a career post-rugby. 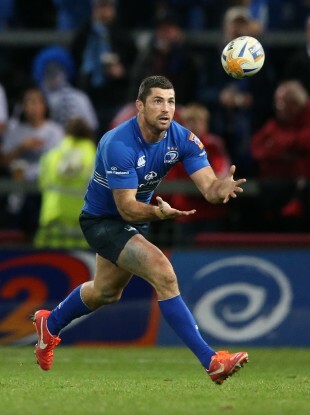 With the likes of the “premium” Rob Kearney, McHugh admits that “brands come to you.” His role is to screen those approaches, helping the client to decide what fits and what doesn’t. Often, the relationship will not be perceived as benefiting the player and “regardless of the money,” no deal will materialise. That McHugh touches upon commercial dealings being “value-adding” for his players in their post-rugby careers brings us to another pillar of his operating philosophy; his unshakeable belief that rugby professionals need to be upskilling themselves even while still playing, in order to be prepared for the inevitable end. Mike Ross’ deep interest in technology has been ideally matched to several brands. ©INPHO/James Crombie. McHugh is relieved to report that “90% of players are aware” of that requirement, and cites the examples of the likes of Dr. Felipe Contepomi, Dr. Emmet Byrne, Ryanair pilot Victor Costello, Leinster academy manager Girvan Dempsey, as well as legal student and rugby analyst Shane Horgan, as having led that culture shift. His job is to ensure that his current crop of players always have the future in mind. “It’s about making sure that they’re skilled to the point that if they’re forced to retire, their drop off the cliff is not as severe as it might have been. To use Rob as an example, he just did an exam in his Master’s [Business] and he’s got a thesis to hand in. He’s also on the board of two companies. “He’s chairman of IRUPA. He’s got a primary degree [Economics] and a post-grad degree, please God, at the end of this year. At the right time, he will be ready to transition into the rest of the world. The reality is that your rugby career is 10 years, while the rest of your working life is 40 probably. Alongside ensuring that manifesto is enacted, McHugh’s firm is also central to ensuring that the players are fairly remunerated for their actions on the pitch. In a recent development, Line Up has entered into “a strategic partnership” with Ryan Constable’s Cornerflag Management. Based out of County Down, Cornerflag itself only last week merged under the banner of Esportif International. For their part, Cornerflag get the undoubted benefit of Line Up’s “commercial, management and activation” skills. Contract negotiations in rugby have become a widespread talking point for supporters and journalists in Ireland in recent years, but McHugh says that may not be entirely fair to the players involved. “I’m not sitting here asking you what I earn, because you wouldn’t tell me; you’re not asking me. You make the decision based on what you see. If you see progression where you are, if you see ambition and you’re comfortable and happy, then why would you leave? Donnacha Ryan visited Perpignan this season, but ultimately signed on with the IRFU. ©INPHO/Billy Stickland. “One of two reasons; you’re unhappy or for more money. In rugby, more money means more attrition, more game time, shorter careers, living overseas, being away from friends and family, learning another language. In Ireland, you’re managed, you have structures around you, friends and family. McHugh believes that “France isn’t the threat that everyone thinks it is,” with regard to Irish players leaving these shores. His visits to Top 14 clubs this year – such as that to Perpignan with Donnacha Ryan – left him unimpressed at the relative lack of recovery strategies, strength and conditioning programmes, mental health structures and nutritional supervision. Ireland has “a phenomenal system” in McHugh’s view, and he underlines that “only a certain number of Irish players have a value in France.” The high-profile, long-running sagas involving Sean O’Brien and Jamie Heaslip have left something of a sour taste, but McHugh says the negotiations shouldn’t have been such public business. There have certainly been cases where stories have been leaked to journalists by agents with the aim of accelerating the process, but McHugh explains that it really makes little difference. Private is better. The Line Up man says the area of rugby agency in Ireland is not a murky underworld of competition, but rather one that strives to constantly improve. “The older generation of agents, the traditional agents – the Baker Managements, the Fintan Drurys – they’ve done what they’ve done for a long time; they’ve set the benchmark. Now the challenge is to evolve and make it better. It’s not competitive as such and it’s such a small world. The likes of John Baker have set ‘the benchmark’ for rugby agency. ©INPHO/Billy Stickland. The conversation slips back, as ever with McHugh, to the players he manages, those relationships which he works so hard to build and strengthen. He stresses the need for his clients to be able to switch off completely from rugby at times, part of the “healthy body, healthy mind theory.” In that regard, McHugh practices what he preaches. I’ve got a wife, I spend time with her to detach. Also, I’m into old cars. When I want to switch off, I’ve got a Porsche that I’m restoring, it’s an old 911 that’s nearly finished. I read car magazines. It’s not my job, it’s my little switch-off. For me, that’s a detachment. “The mentality of playing Playstation and going for coffee all day is gradually getting whittled down for the players. I think you have to have positive distractions. I think you need to have interests even beyond friends, family and your sport. Email “'France isn't the threat that everyone thinks it is' - rugby agent McHugh”. Feedback on “'France isn't the threat that everyone thinks it is' - rugby agent McHugh”.